butterfly that lurks about the undergrowth in our forests. usually restless, but this time it came down to puddle. Fantastic pictures Bluebottle. It looks as though there is an amazing range of butterflies there. Do you know the Latin name for this one. It seems that the common names change around the world!! It looks a little like a Eurema. It's great you like this one! The wing shape does resemble eurema, but this fella is a tiny lycaenid. The latin name for him is neopithecops zalmora. I don't think there are very many in this genus, but all of them have the similar greyish undersides. Thanks. I have Googled it and now see that it is a lycaenid. It really is a beautiful little butterfly and quite unlike anything we get in Europe. I am intrigued about the number of butterflies that occur in Singapore. There are so many good web sites about them. I thought that Singapore was quite built-up. Are many of the butterflies migrants from neighbouring countries? Maybe it is just that there are a lot of enthusiasts in Singapore, but I haven't noticed much information about butterflies in other countries in the area. I live in East Lothian in Scotland, where much of the landscape has been turned over to agriculture. There is very little habitat left and (along with the weather) this has had a dramatic impact on the number of butterflies we have here. There is only a very limited number anyway (about 20 species) but we don't get that many of any of them flying around!! Yes we do have lots of butterflies here. 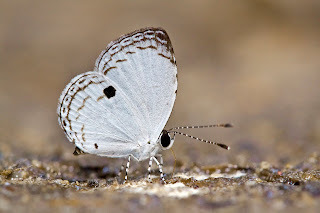 Singapore is a very urban country but quite a number of butterflies can be easily spotted along the roadside. The rest live in gardens or in forests. We only have small pockets of forested areas but they are nonetheless very rich in wildlife. That's why it has become quite important here to protect our biodiversity. But only a few fly in from Malaysia. That's interesting Bluebottle. I imagine that the climate must be the big difference then. The area around here is predominantly agricultural, mostly wheat and barley. The farmers plough right up to the edges of the fields and spray out any weeds. Although we have plenty of road verges and gardens, we don't have a lot of butterflies. Having said that, strangely the number of species has been increasing over the last thirty years! The new caterpillar book looks fantastic. I also like the look of the Butterflies of Singapore book. Hopefully they will be available over here soon. The climate here is usually really hot and humid!! And now it's raining almost everyday too. But that's why the plants flourish so we have such a variety of butterflies. I hope you get to see even more species up there soon! !